This IBM® Redbooks® publication provides an overview of IBM Copy Services Manager (CSM) for IBM Z and open systems, and documents a set of scenarios for using IBM Copy Services manager to automate and manage replication tasks based on IBM Storage. 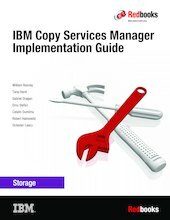 This book reviews and explains the usage of copy services functions and describes how these functions are implemented in IBM Copy Services Manager. IBM Copy Services Manager key concepts, architecture, session types and usage, and new functionality as of IBM Copy Services Manager version 6.1 are also described.